The fact that for the first time in the State’s modern history, a major industrial project will be sited on the property line of a Rhode Island state forest. 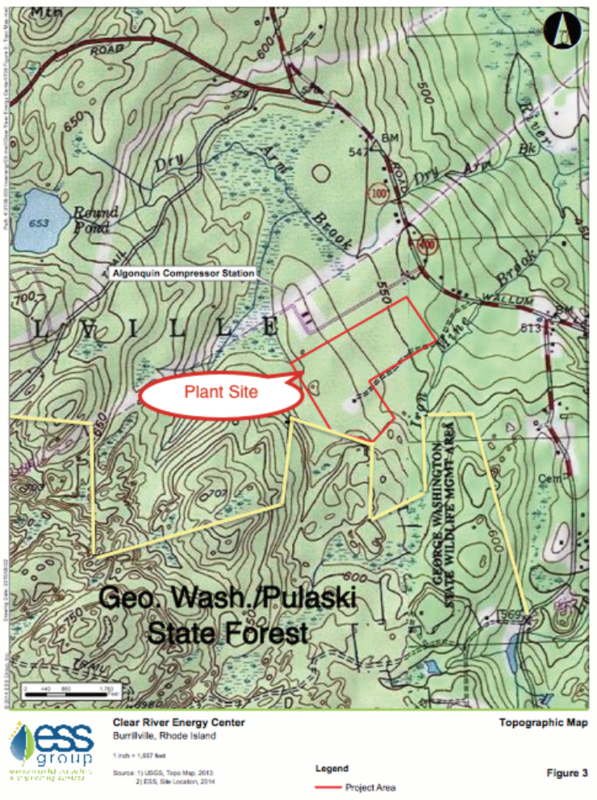 If approved, the Clear River Energy Center will be built on the border of the George Washington Wildlife Management Area/Pulaski State Forest in the “Tri-state Corner” of northwest Rhode Island. Moreover, George Washington/Pulaski is contiguous with five other publically-owned forests in five towns in three states: the Durfee Hill and Buck Hill Wildlife Management Areas in Rhode Island, the Quaddick State Forest and Park in Connecticut, and the Douglas State Forest and the Mine Brook Wildlife Management Area in Massachusetts. Together with the privately protected Narragansett Council Buck Hill Boy Scout Reservation, this sprawling ecosystem totals more than 25 square miles. This forest, in turn, is the northeast cornerstone of a still more vast and important forest dubbed variously the “Southern New England Heritage Forest” by the North East Forester’s Association, the “Borderlands Forest” by The Nature Conservancy, and “Canangogum” by its original conservators, the Native Americans. This greater region is the only forested corridor remaining on the Northeastern Seaboard connecting the coastline with the interior. In an iconic nighttime satellite photograph, it shows up as the only column of darkness in the arc of electric light sprawling from Washington DC to Boston. A moose traveling the corridor from Westerly to Quebec could feed and conceal itself the entire way while crossing or under-passing just four Interstate highways. The exact ecological value placed on the forest in the vicinity of the power plant site is superbly illustrated in the Rhode Island Department of Environmental Management’s interactive “Conservation Opportunities” map found in its 2015 Wildlife Action Plan. By zooming in on western Burrillville and turning off all the valuation “layers”, then turning them on one-by-one, you see the power plant site progressively buried, as if it were a geologic stratum, until it rests in a position analogous to the bottom of the Grand Canyon. In 2012, when DEM teamed with The Nature Conservancy to purchase in this area the Croff Farm Brook wetland from the Boy Scouts, TNC’s Rhode Island director, Terry Sullivan, said, “The forests in the northwest of our state provide so many benefits to the people of RI, including wonderful recreation opportunities, protection of freshwater supplies and room for wildlife to thrive. It is perfectly fitting that this place, where so many young men learned to appreciate the importance of nature, will now be protected for many more generations of Rhode Islanders to enjoy.” DEM director, Janet Coit—who also sits on the Energy Facilities Siting Board added, “This acquisition is particularly exciting… Because this parcel sits within one of the largest undisturbed areas in all of Rhode Island, it is particularly valuable for wildlife. The amount of rare and uncommon species on this property is amazing!” Decades of scientific work done in this forest underscore these statements. In conclusion, “It’s the location, stupid!” is the crude but perfect meme summarizing why the Clear River Energy Center should not be approved on this site. Opposition to this plant is no more NIMBY than it was in the ’70’s when a rag-tag but far sighted little band called Save the Bay—to the lasting thanks of us all—opposed the Tiverton oil refinery, the Prudence Island LNG terminal, and the Rome Point nuclear power plant. The signature asset of modern Rhode Island is our natural environment. If Providence is to become the Seattle of New England, as the Governor and many progressive leaders aspire, we cannot fail to save our forests as well as our Bay. We cannot site The Clear River Energy Center on the border of the George Washington/Pulaski State Forest! *Reference map below taken directly from the full application available on the RI Energy Facility Siting Board website. Bill Eccleston is a lifelong outdoorsman, teacher, and former co-chairman of the Burrillville Comprehensive Planning Committee and currently lives in North Providence, Rhode Island. “It’s a Matter of Trust” and we don’t trust the process. I live in Cranston and I am in the fight with the fine people of Burrillville to save our state from this unnecessary power plant! EXCELLENT! Thanks, Bill. You are So right. Well said Bill. thank God we have you to fight for our Beautiful town. I was born in a small house next to Ross’s Pond in Bridgeton, Rhode Island in 1940 to Kenneth and Elizabeth Sherman. My parents had seven children. We were not wealthy materially but were had everything we needed and especially, we had wonderful times skating and fishing and swimming in Wilson’s and in the brook behind the Bridgeton School, also, Pascoag Lake. I took care of my siblings for my Parents. There were many days I would pack a lunch and walk with them to one of these places. We not afraid walking on any of our streets. The streets were safe and the air we had to breath was always so fresh and clear and the water we swam in was clean. The Town of Burrillville was the best place in all of America to live. I have so many wonderful memories growing up and living most of my life here. Please fight as hard as you can to keep Burrillville for the generations to come.Thank you. Ruth Sherman, Pascoe,Elliott. True. But the whole idea of this type of plant, in ANY location, is ridiculous. We have the research and experience that shows it is harmful to us and to our planet. We need to stop the bleeding and use alternatives.